Vote over at TWC and you can see Malaya's opinion on magic in general. Friendly reminder that Connie/Flora is ~totally delusional~. One of the things I find really fascinating about people is that you're never going to be the bad guy in your own story, which is in large part why I included Aubrey's telling of this flashback in Chapter 7. The information she got from Connie clearly made Connie the victim in this situation (and I reused a bunch of the same panels, but with more blood this time! ), but the reality is a lot more complex. She also made Tom less of the aggressor, which I like to think is because Connie literally refuses to believe most of this incident happened. Anyway, all questions here will be answered with time, including why grandma would have chosen to stick around and help at all, and why she showed up in the first place. I won't say exactly how much of Connie is based on my own mother, because I love her and may she rest in peace, but her ability to "not remember" the past and to sugar coat various explanations of her intentions miiiiight be my mom. I spent a lot of my childhood asking my mom why she named me Shawn, and I got a multitude of answers, and none of them were actually answers, and that's not a big thing to have to avoid explaining lol. 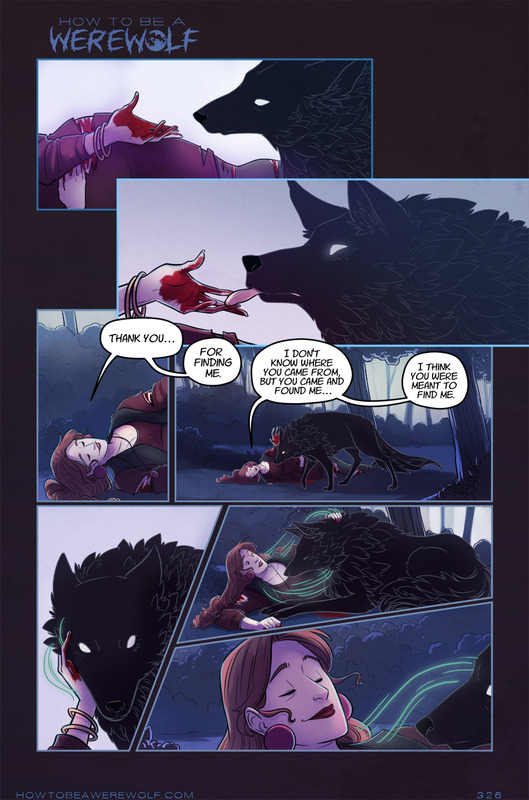 Before you ask why this wolf (who is Elias's grandma, yes...and that'll be clarified further in a few pages) would lick her bloody hand...well, dogs are gross and that's my reason. My dog tried to eat a whole piece of pizza off the street, so I assume they'll lick just about anything, and granny's more wolf than person at this point. I keep forgetting to plug this, but I'll be at the Chicago Comic and Entertainment Expo (C2E2) next weekend! April 6-8 at McCormick Place, booth F5. I'll be there with my friend/emotional support peacock Neil, so if you see a large bearded man at my table instead of me, please say hi to Neil anyway and he'll let you know where I'm at. Assume that I'm searching for food or going to the bathroom, since those are the two things I'm most likely to do if I'm not at my table. 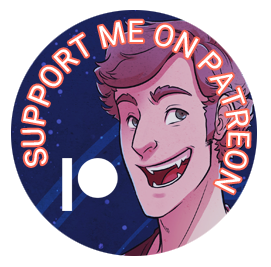 I'll have copies of the first two issues of How to be a Werewolf (chapters 1-3), these neat holographic sticker sheets, and a bunch of prints. Whatever I don't sell at C2E2, I'll try to put up online for sale. 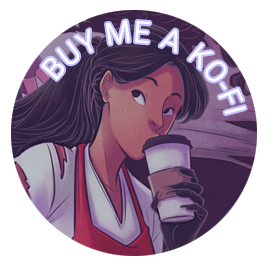 I'm leaving in mid-May for a week in Los Angeles, so I may not get the extras up in an online store right away, but they'll be up before summer. The first two issues are all black and white with full color covers, and I'm selling them for $5 each or 2 for $9. Sorry for the price, but the small run makes this stuff expensive :|. I do plan to print graphic novels of all this, possibly by the end of this year, but I need to work out some logistics first! Gotta nail down pricing, a printer, prepare and edit all the pages, hire a few people to help me because I'd like to not kill myself trying to do this all alone, shipping, sitting down with my accountant to work out how not to get hammered on taxes, etc. I don't have a great way to break up the books, unfortunately. I'm thinking chapters 1-5 (126 pages), then chapters 6, 7, and 8 in separate smaller books? IDK. Or I'll combine chapters 5 and 6, since 5 has some color in it. Maybe I'll hire someone to help me color chapter 5 and the first bit of chapter 6 as an incentive. It's a lot and I'm tired now :|.